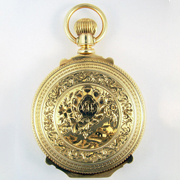 Elgin Watch Co. 18 size 15 jewel hunting case lever-set pocket watch with magnificent 14K gold drum style box hinge hunting case. A spectacular piece with ornate engraving detail in superb crisp condition and with a tremendous overall in hand presence. Small front shield is engraved with initials, rear shield with a butterfly. Cuvette has an 1888 inscription. Watch is fronted by an attractive sunk-seconds enamel fancy dial. Movement serial number is 9124861. Running and a very nice looking movement. Dial is superb. Case is spectacular showing no wear with exquisite crisp engraving detail. Glass crystal has some small bits of glue excess around its seat.